Wow so much to cover in one review! 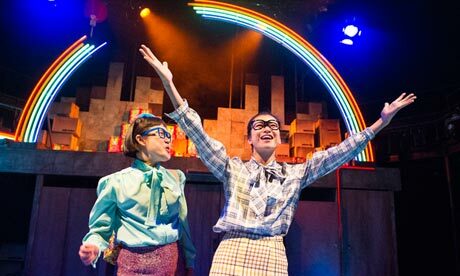 I suppose there *is* so much in contemporary China to explore in a play. Hell, there’s enough in my one very small part of the Chinese experience to last me a lifetime hence I usually find this kind of thing a turn off too. But this sounds like a necessary kind of play. I often think about the way the Cantonese language is so brash and direct and reflect on whether this developed with the Chinese way of being or whether it’s just coincidence. Did you find this a difficult play to watch, emotionally? In recent times many films and books have moved me. But usually with an uplifting message. This sounds a bit different from that? Thanks for your thoughtful comment. I think I’m initially pretty sceptical with plays that try and deal with too many issues but in the case of China, I do think that there’s a lot to pack in! I think the directness of Chinese families is reflected in the language (especially with Cantonese!) and from my tiny experience, I think traditional Chinese families are so complex and often I find it difficult to relate to my elders and their beliefs and ways of being. I did find some bits very difficult to watch and the ending especially moved me. I think there wasn’t a real uplifting message, though, especially as the writer so effectively contrasted the ‘extreme'(almost frantic and erratic) happiness of the self-help world and the aspirations of becoming part of the elite city folk with the pervasive, inconquerable power of the government. It seemed to be saying that there is no way out without an upturning of the communist regime which I think is probably true. Nevertheless, it is a morose message and a thought-provoking one. I wondered if it would be hard to do an uplifting play about China. A long time ago I did see a very good, very funny one about cultural differences. I think it is easy to do comedy about the Chinese. They’re pretty odd in lots of ways! But when you start to look underneath the eccentricities, there is a lot of sadness. I think that is a problem with the Chinese in general. Because there is so much sadness, it can be too much to deal with, so brush it away, brush it underneath. Don’t be sad, because to admit sadness is to start to look at how bad things really are and then you couldn’t bear it. Only look to what you can hope to achieve, and how you can go about it. I didn’t realise there was so much self help out there. Thanks for bringing your review to WordPress. It’s good to know these things are happening and ideas coming out there.